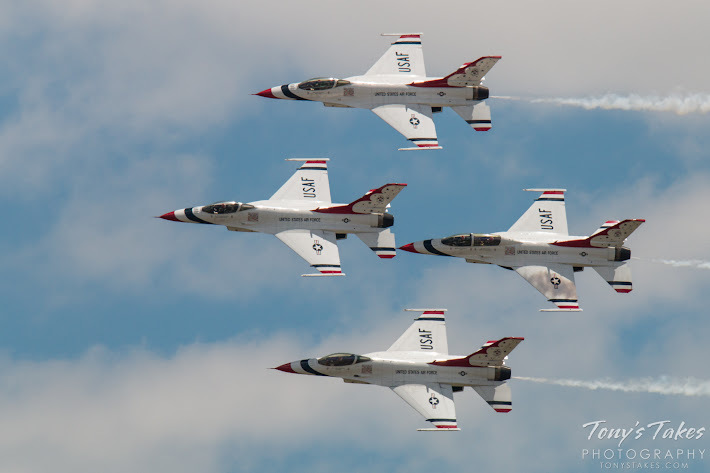 After work I raced out east of Denver where there is a major airshow this weekend in hopes of catching the Air Force Thunderbirds practice. Found a great spot to watch other than the fact the performance smoke was blowing right at me making for a good bit of haze. Marble headstones mark the graves of our nation’s veterans at Fort Logan National Cemetery. Each of these represents someone who has served, some who have made the ultimate sacrifice giving their lives in service of this great nation. As Americans we have given our own blood – our sons and daughters, our mothers and fathers – for our freedom and for the freedom of others. When He comes to call, we mourn their loss but sadly we all too quickly forget. Memorial Day serves as a catalyst to ensure that we do not let their sacrifice be in vain, that we always remember what these brave men and women have done. As I watched this man at Fort Logan National Cemetery this morning, I couldn’t help but wonder who he was there to see. He was clearly moved as his eyes went between the grave and the flag. Perhaps a grandfather that had served in the Battle of the Bulge and demonstrated extraordinary heroism against an enemy onslaught? A high school buddy who he went to Vietnam with but whose life was cut short in a God-forsaken jungle? Perhaps a son, daughter, niece or nephew who went to a foreign land seeking vengeance against those who dared harm our nation on 9/11? I saw many people there today while I visited my dad and a few others I knew. All of the visitors undoubtedly have stories to tell about those buried on this hallowed ground, just as I do. It is humbling to walk among those who have served and sacrificed in defense of our great nation. May God bless the United States of America. For nearly 240 years, brave men and women have answered the call to service and donned the uniforms of this nation’s military. Like myself and my family, millions of veterans have served this nation in all capacities. No matter their assigned job, they have served with honor, courage and commitment from back here in the states to places overseas like Tora Bora, Fallujah, Normandy, Anzio, Guadalcanal, Khe Sanh, Inchon and many other God-forsaken hell holes across the globe. Each has made their own sacrifices for God and country. Sacrifices of time, mind, body and soul. All of us, all veterans, believe in this country and believe in the cause. I, as they do, firmly believe that the United States of #America is a beacon for all others – where we lead, others follow because the liberties and freedom we have and offer are cherished by all beings and are a God given right. That spirit of patriotism and loyalty echoes loudly throughout the hills of Arlington National Cemetery and in the voices of veterans you can talk to today. Our service men and women are the finest examples of what this great nation stands for and all are worthy of the highest praise and greatest honors. Please take time today to remember the veterans of this great nation and what they have given to all of us – our very freedom and freedom to millions of others. One for Throwback Thursday. Taken in August 1996 while in the Persian Gulf conducting Operation Desert Strike. The ‘island’ of the massive aircraft carrier and F/A-18 Hornet and EA-6B Prowler aircraft are silhouetted by the rising sun. Combat operations were taking place against Iraq to stop Saddam Hussein’s genocidal attacks against Kurds in nation’s north. Tensions were further heightened by the Khobar Towers bombing in Saudi Arabia two months before that killed 19 U.S. service members. For those that don’t know, I served six years in the +U.S. Navy primarily working on the electronics on S-3B Viking anti-submarine warfare aircraft. Lots of stories from those days and I am proud to have served my nation. Thornton Veterans Memorial, Colorado . This local veterans memorial is one that is particularly special to me as I was chairman of the group that worked for years to fund and build it. In the foreground you see the winged angel, ‘Grace’, releasing a dove carrying dog tags aloft. In the background you see the flag poles and in between them is a 9′ 11″ high five-sided obelisk. On it are inscribed core values of United States military service: Honor, Integrity, Sacrifice, Duty, Courage. I went to Fort Logan National Cemetery this morning to see my dad as well as thousands of others of our nation’s heroes. Memorial Day is, in my opinion, one of the most important holidays in the United States. So many have served and sacrificed for this great nation. My dad, my uncles, my nieces and nephews and I have all proudly worn our nation’s uniforms. We all have come home. So many do not. It is for these men and women, those who gave that ‘last full measure of devotion’ that Memorial Day is for.